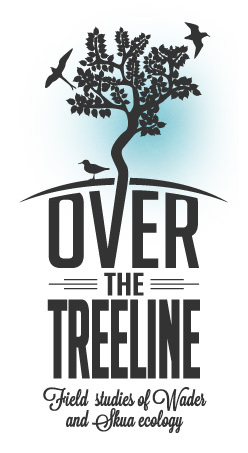 The 2014 field season is almost over! 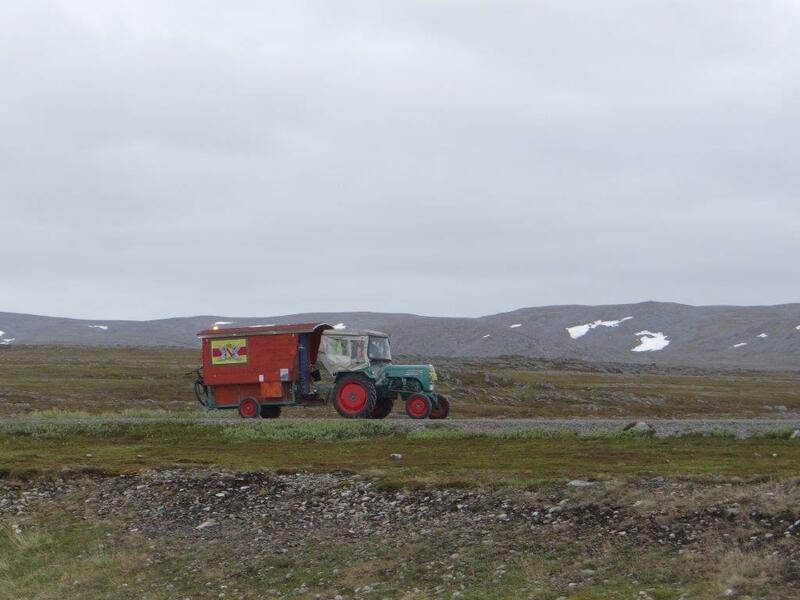 With Tim leaving Ammarnäs, and Morrison, Denise and me leaving Slettnes, only Kees and the Tobseda team are still in the field. 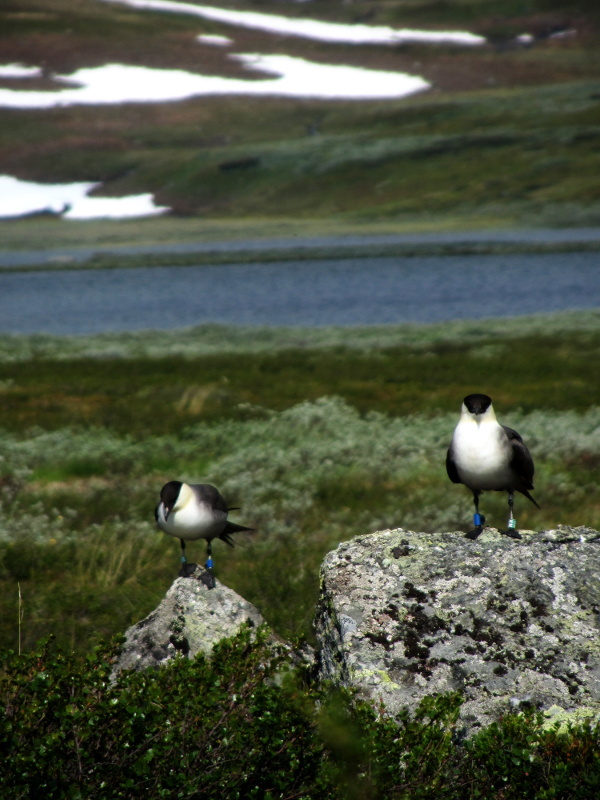 Morrison placed the last of 40 loggers on Arctic Skua in Slettnes. 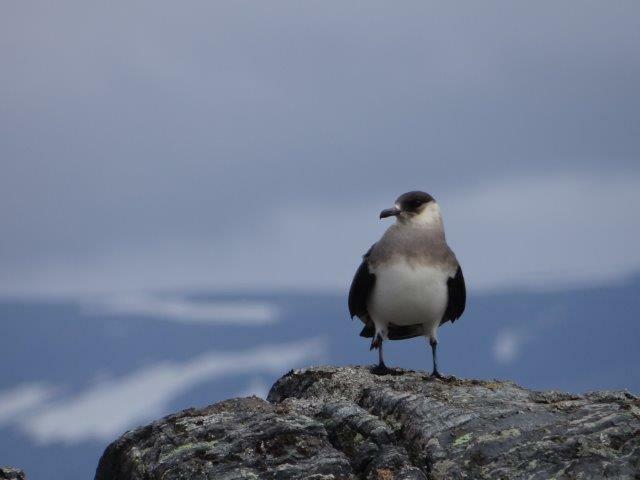 When we arrived, Arctic Skua chicks were fledging en masse, making it a real challenge to tell which juveniles belonged to which adults. We’ll have to do the math yet, but it seems like this was a very good breeding year, as many pairs managed to successfully raise two chicks. Over a hundred chicks have been ringed. 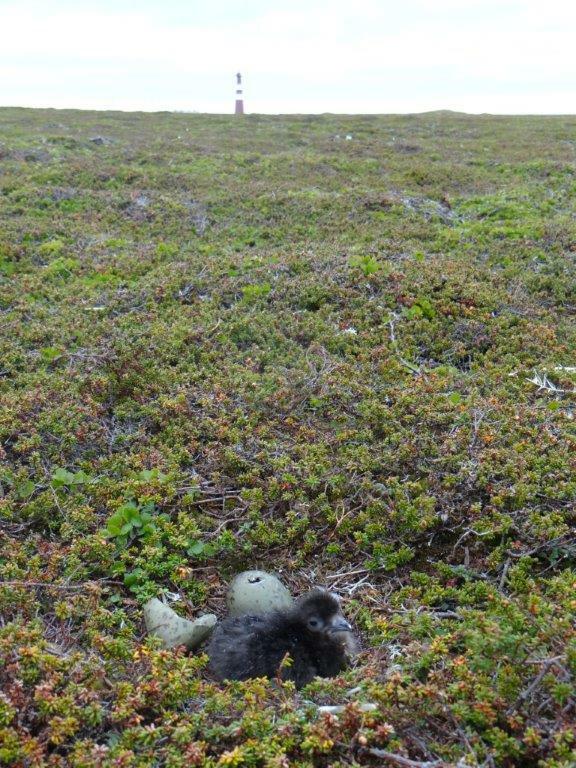 The two fluffy Great Skua chicks grew from huge to enormous, see the picture, but were not even near to fledging when we arrived. Dark (left) and light (right) Arctic Skua siblings. 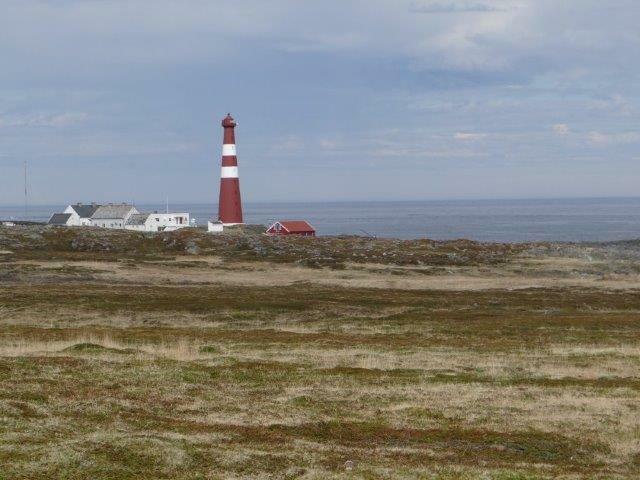 Beside a perfect area to conduct such field studies, Slettnes is a really great place to observe other birds and marine mammals. We had a great time observing Otters, Humpback and Minke Whales, Atlantic White-sided Dolphin and many seabirds, including Manx Shearwater, Black Guillemots and King Eiders. On 26 July, two Sandwich Terns passed overhead. This must be one of the most northerly observations of this species, considering it normally does not reach further north than halfway Norway at about 60 degrees N. Slettnes is at 71 degrees N! Great Skuas. Two fluffy youngsters. Meanwhile, Tim finished the work at Ammarnäs. In total, 6 Long-tailed Skua chicks fledged. One chick made it far but got injured on its wing, presumably by Raven attacks, and will not make it. 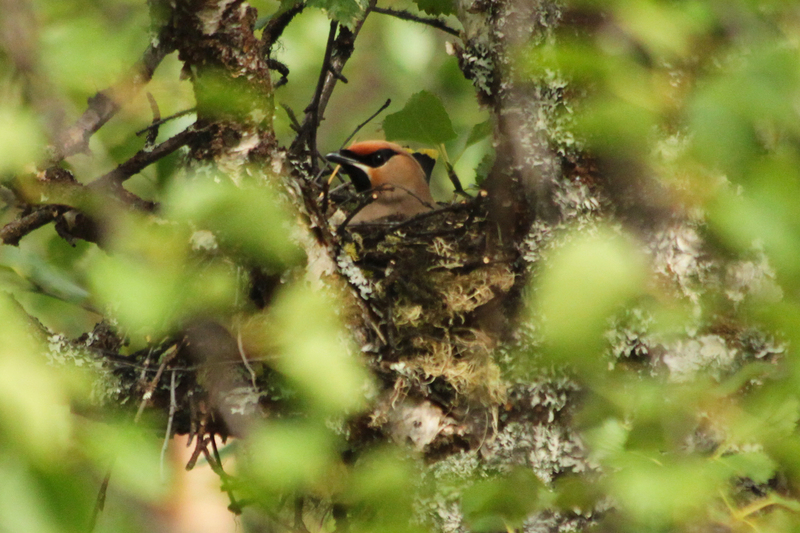 The Waxwing nest was successful and the chicks have been ringed. 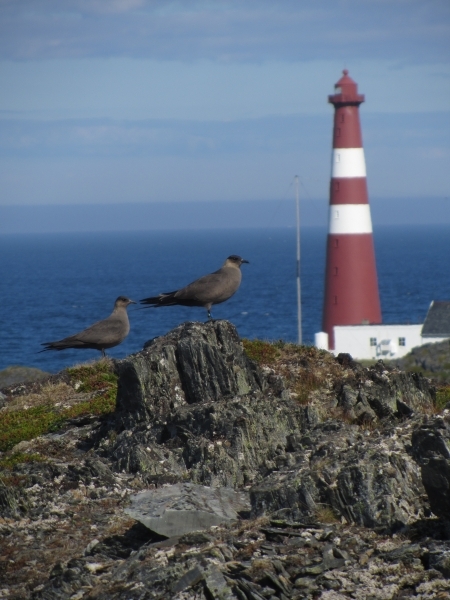 Two dark morph Arctic Skuas, one carrying a geolocator, with the inescapable Slettnes lighthouse in the background. Morrison and me extracting the last of the 20 phalaropes from the mist net. Mounting a geolocator on a male RN Phalarope. The icecream stick is removed later on and makes sure there is some room left underneath the logger. 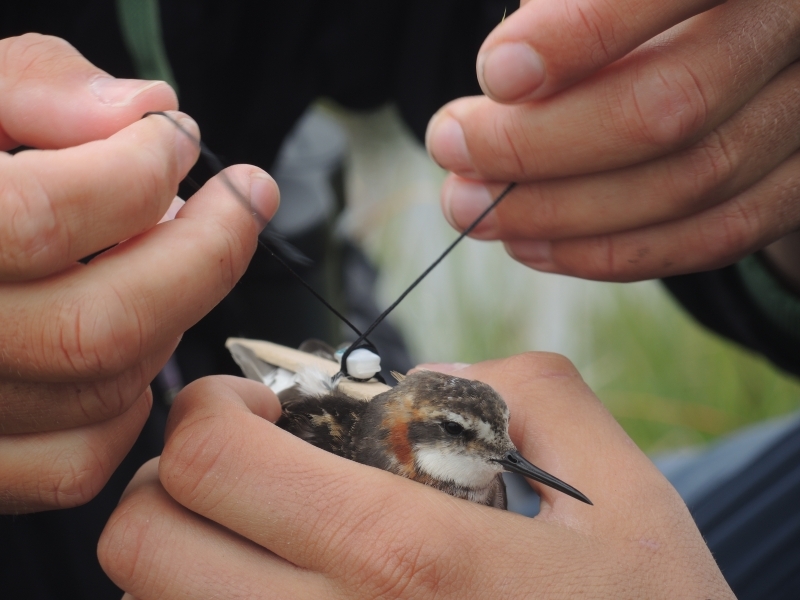 Yesterday we mounted the final geolocator on a Red-necked Phalarope! We fitted 20 in total: 13 on males and 7 on females. Upon approaching the 20, it became increasingly difficult to find and capture new ones. Females have left by now, and the only two breeding males in the area that didn’t have a logger yet occupied extremely wet and inaccessible areas. Although I went into the marshy ponds as far as possible (wearing only shorts…), they won the game! Yesterday, there was suddenly a group of five males in the ‘big’ lake of Gelmetje; probably failed breeders. 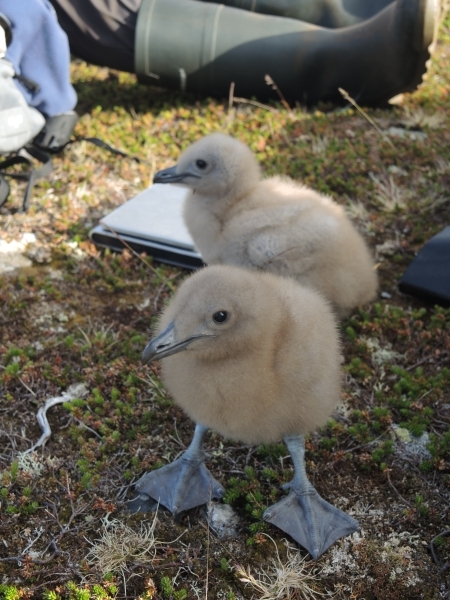 We captured three of them and surprisingly, one of them was already ringed as a chick in 2013 by Johannes. This adds to a growing number of recaptures of birds ringed as chicks in the same area. 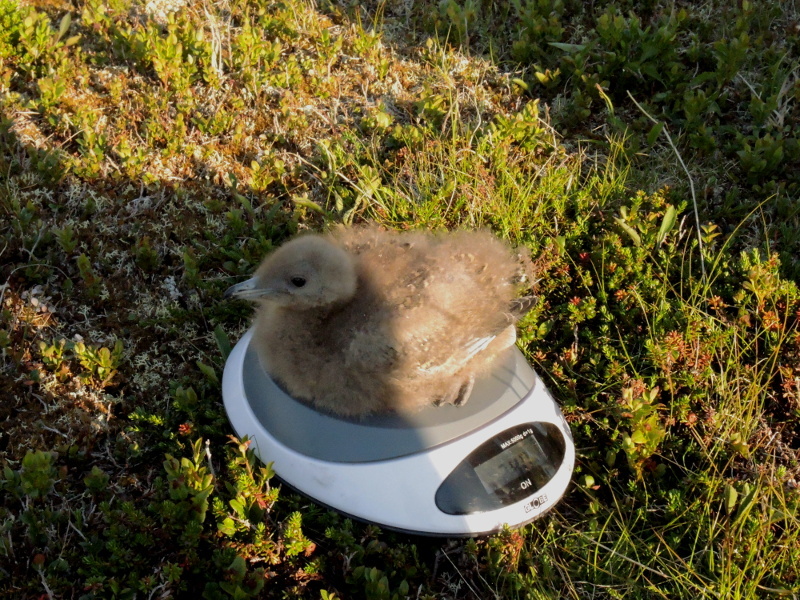 Skua-wise the work is rather ‘stable’: we are checking the few chicks that are still around. We monitor their growth and in return they get some jewelry (a steel ring and a green colour ring). 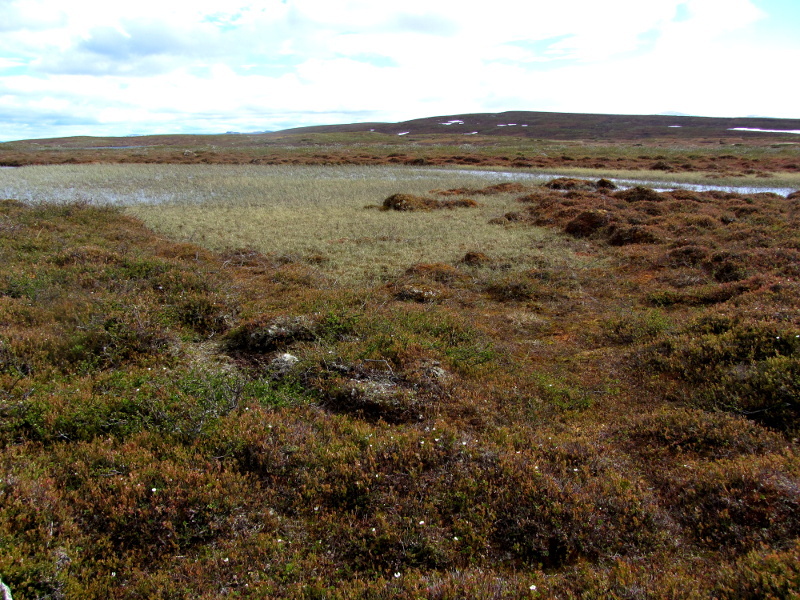 In Raurejaure we have only four chicks left, and singletons are in Gelmetje and Björkfjället. They are getting bigger and bigger and are around 200 grams already. 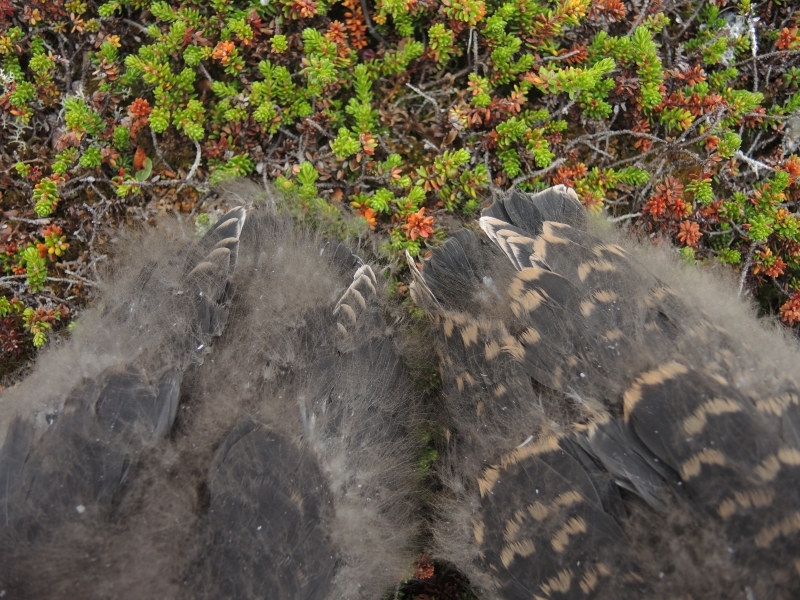 Juvenile feathers are emerging but the wings are still stubby. See below for one of these beauties! Fluffy Long-tailed Skua chick on the 1st of July. Higher mountains of Ammarfjället in the background. One of the succesfull pairs: KM and NR, keeping an eye on their chick and us. Lake Geppejaure in the background. Chick time! Familiar to regular guests of this blog: a Golden Plover. My girlfriend Denise found it on her first day in the field! 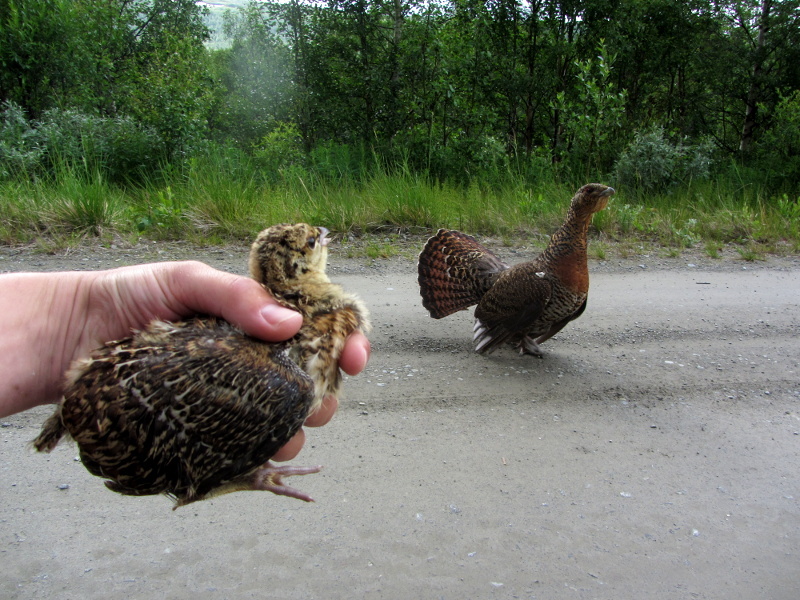 We had some encounters with Caipercaillie chicks chaperoned by their protective mothers, mainly along the gravel road towards Gelmetje and Björkfjället. Big mamas! Yesterday, we had two families, a male Hazel Grouse and an immature Moose male. Other goodies these days include the occasional Golden Eagle, Ring Ouzels and quite some Bohemian Waxwings. 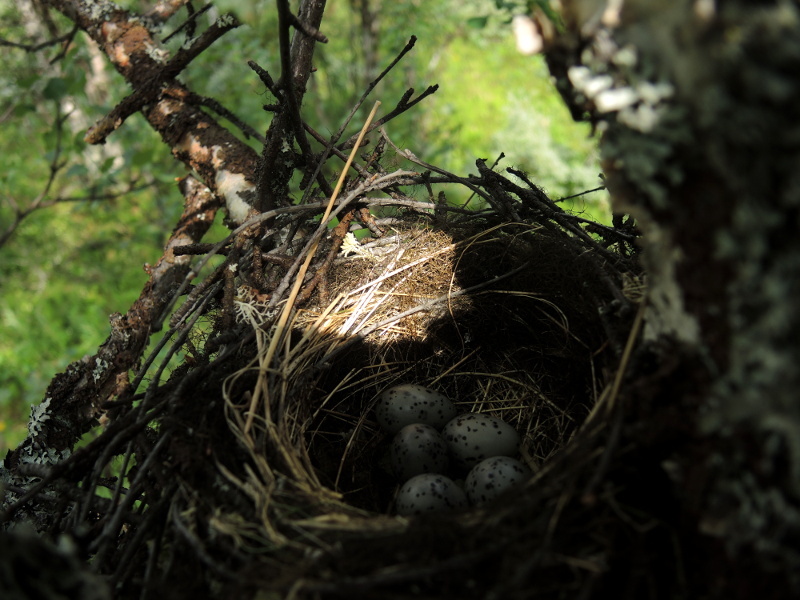 We even found a nest of the latter! 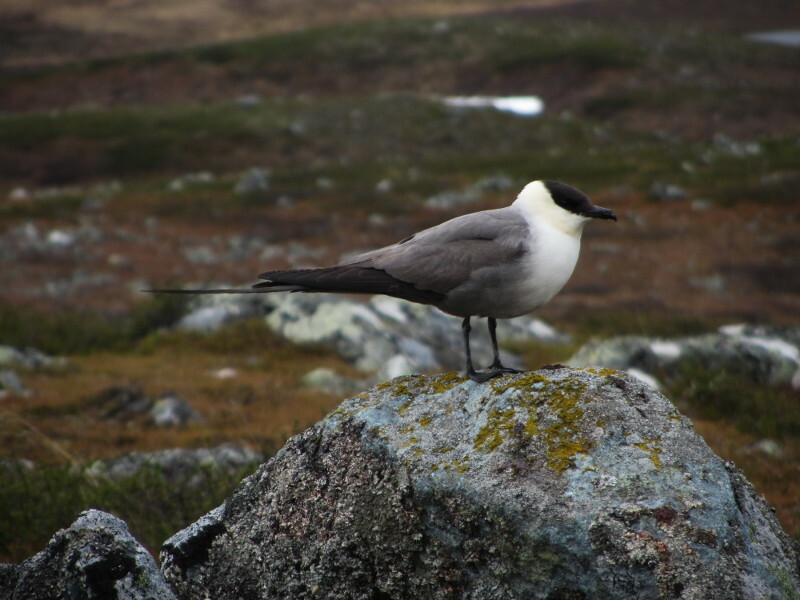 Like the Arctic Skuas in Slettnes, the Long-tailed Skuas in Ammarnäs are now rapidly hatching. It usually takes only a few days before all have hatched; this is strongly peaked. However, the hatching period appears to be a rather vulnerable period: in particular many one-egg clutches vanished (predated) in the last week before hatching, or – in the case of one pair in Gelmetje – both a chick and an about-to-hatch egg have been predated. Others are more lucky, such as the chick in the picture below. 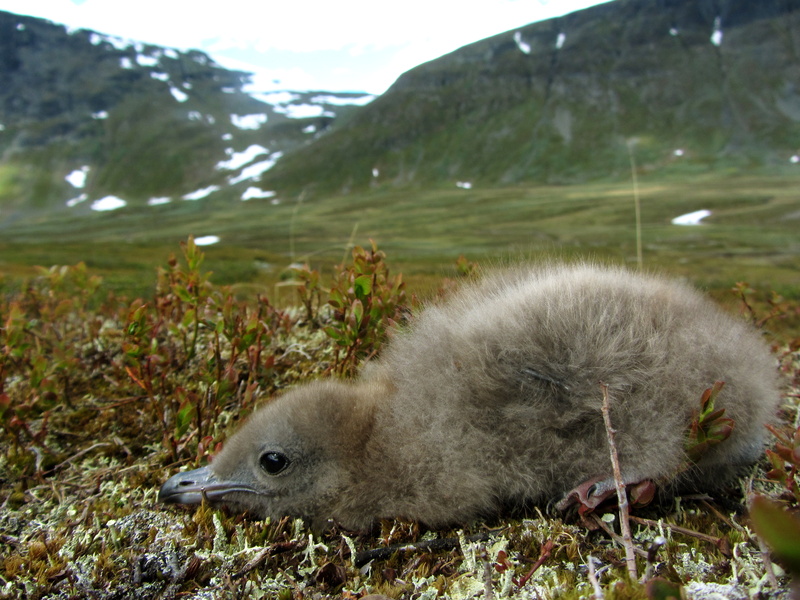 A one-day old chick of a Long-tailed Skua. We have been focusing on capturing Red-necked Phalaropes during the last days, now using mistnests to catch them. Red-necked Phalaropes are so-called uniparental, meaning that one parent is taking the lion’s share of the parental duties. In this case, that’s the male. During incubation, these guys need a break now and then to do some foraging. We found out that many males used the same pond (full of small yummy flies) as a local snackbar. Here, we managed to capture five phalaropes, two of them wearing geolocators from last year! That makes a total of four retreived loggers. 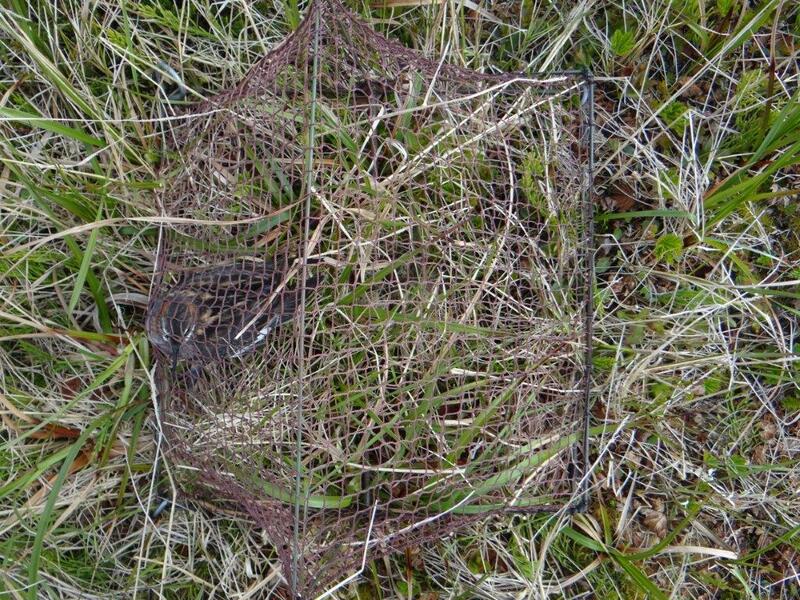 Also, we lured females into mist nests (see below, the first adult females to be caught here) and we recaptured a male today that I ringed in 2010 when it was still a chick of only 4-5 grams. Red-necked Phalarope. Definitely the hottest chick in Gelmetje. Already a while ago Tim did a very good discovery: a nest of a Bar-tailed Godwit. Despite their big efforts for nest searching, the wader team never found one between 2008 and 2013. Sadly however, it looks like the nest is abandoned. When we checked it today, the eggs were already cold and wet. ‘Sunset’ on midsummer evening at Raurejaure. 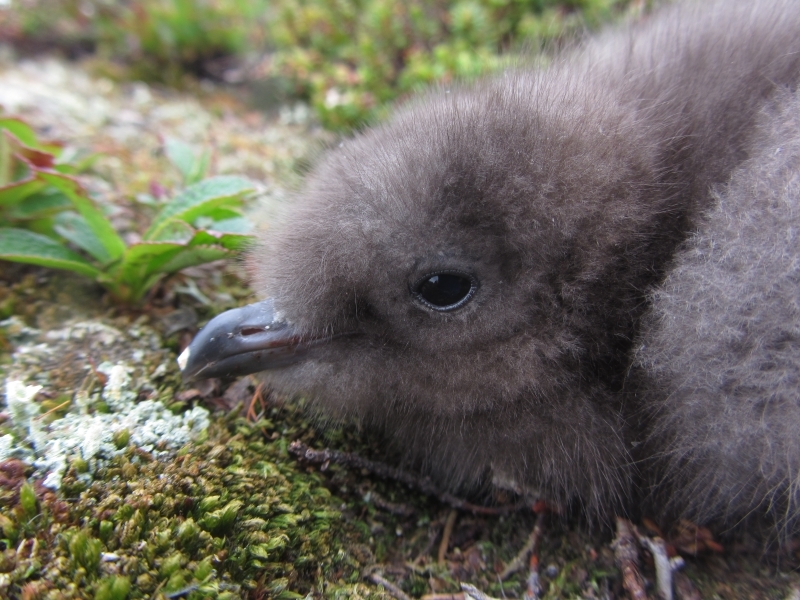 We found the first skua chick yesterday. The main birth wave is expected at 26 June. Especially on the east part of the peninsula the pairs are slightly advanced compared to the majority. Dunlin hatched as every year on 16th of June. 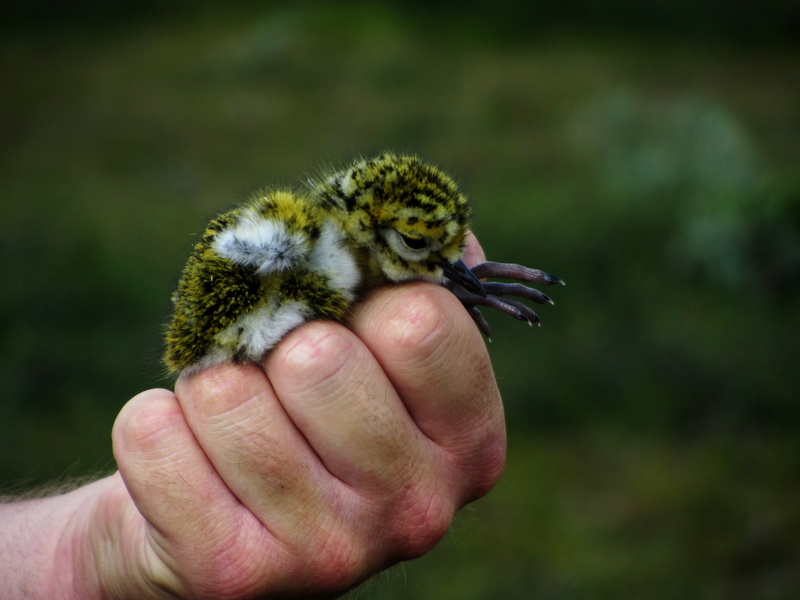 Also phalaropes start to have chicks now and we found the first whimbrel chicks today just 100 m from the cabin, a new chick hand species for me! We have had Karl-Birger Strann and his wife and assistant Vigdis visiting totgether with Karl-Otto Jakobsen. 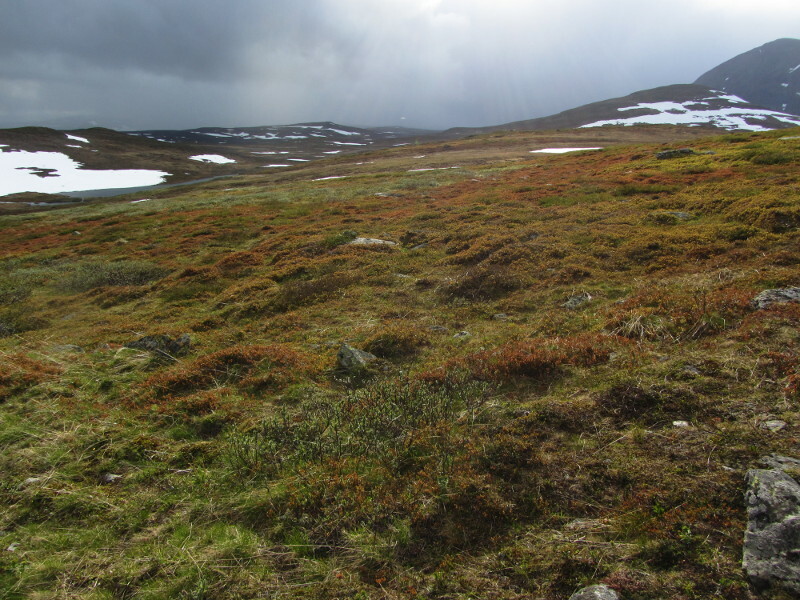 Karl-Birger has worked in the area for decades and it was his research that was the fundament for the Ramsar status Slettnes has nowadays. It was great to spend some time together in the field and KB helped to find some more phalaropes. In the meantime Hans and Janne Schekkerman left. Morrison Pot and Daniel van Denderen arrived to take over from me from 23 June onwards. At the moment we managed to put loggers on 27 Arctic skua and on 12 red-necked phalaropes. If everything goes well the aim of 40 and 20 should be feasible. Similarly to Rob at Ammarnäs we also had several days with very strong winds, low temperatures and snow and rain. Also Hans-Ulrich Rösner and Barbara Ganther arrived who have studied the Dunlin population for an impressive 22 years. Monday evening we had my farewell dinner at the lighthouse with freshly caught salmon and a super desert called ‘wårldens best’ (best of the world, haven’t tasted all of them but this was definitely superb!). Now it is back to ‘normal’ work for me. It has been a while since my last post. We’ve had a few camping sessions up in Raurejaure, under very chilly conditions. Hard, cold winds (~7 Bft), from time to time brightened with some snow, hail or regular showers…. Hence, not the ideal conditions for catching. Still, I managed to get two more skua geolocators, making a total of three now – all with three full tracks back and forth all the way down to the Benguela current, which is off Namibia/South-Africa. Impressive journeys! The coming days seem to hold good weather. 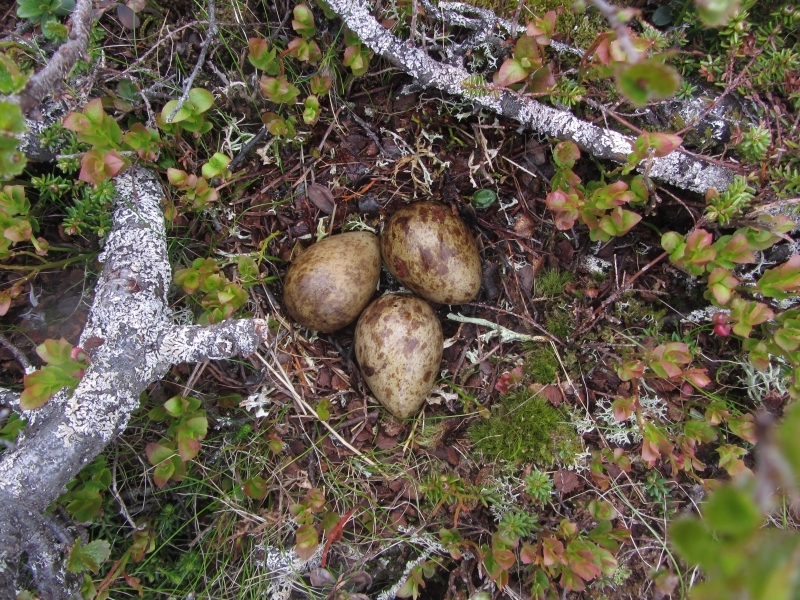 As the Long-tailed Skuas eggs are about to hatch, now is the last time to easily catch adults on the nest. Hope it will work out! We’ve read a dozen Golden Plover colour rings (have to determine the exact number yet) and a single Dunlin. With the entire wader team missing, we’ve only found very few wader nests, so I am afraid we will not get a good estimate of predation rates on wader nests for this year. We did find some in Gelmetje though; see below for one bird staying put on the nest, entirely relying on its camouflage. There is a bird somewhere on this picture. See if you can find it! This looks nicer than it actually was, in terms of temperature and humidity. After 1,5 week we finally have an internet connection. So here a short update from us at Slettnes, Northern Norway contributing to Rob’s Phd project on arctic breeding seabirds. 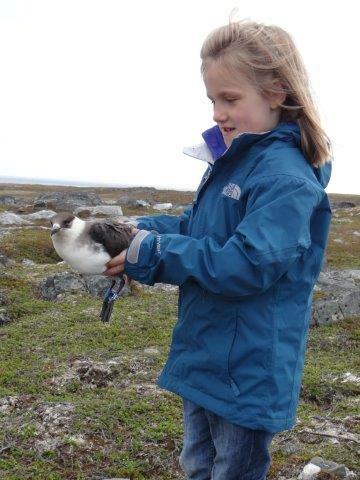 We (myself, my husband Hans Schekkerman and 5 year old daughter Janne) spend the past week searching for Arctic skua and red-necked phalarope nests, catching them and put geolocators on them. 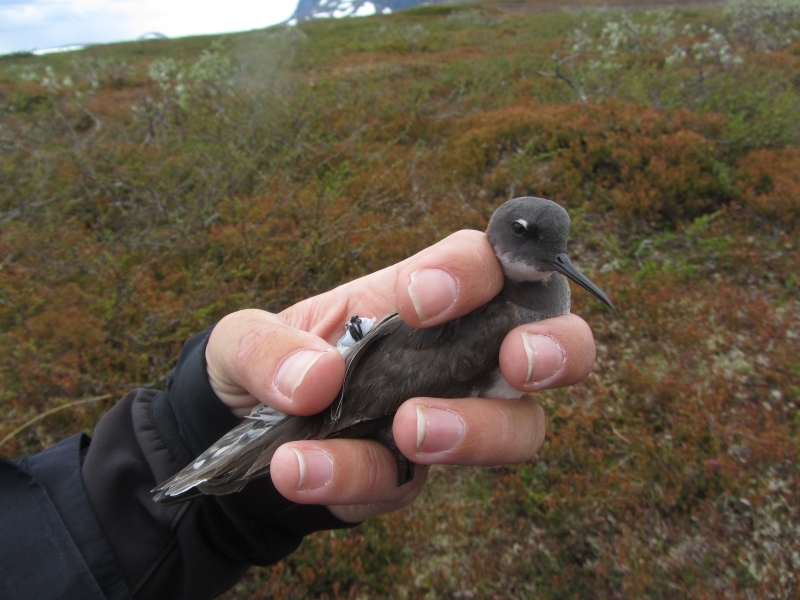 So far we put geolocators (or engines ‘motortjes’ as Janne calls them) on 17 Arctic Skua and 5 on phalaropes. With 400 pairs of Artic Skua there are plenty of opportunities but catching does not always go as quickly as we want, with at most 4 per day untill now. The phalaropes are not as common. Today I checked again nearly all potential sites but came no further than the seven nests already found. 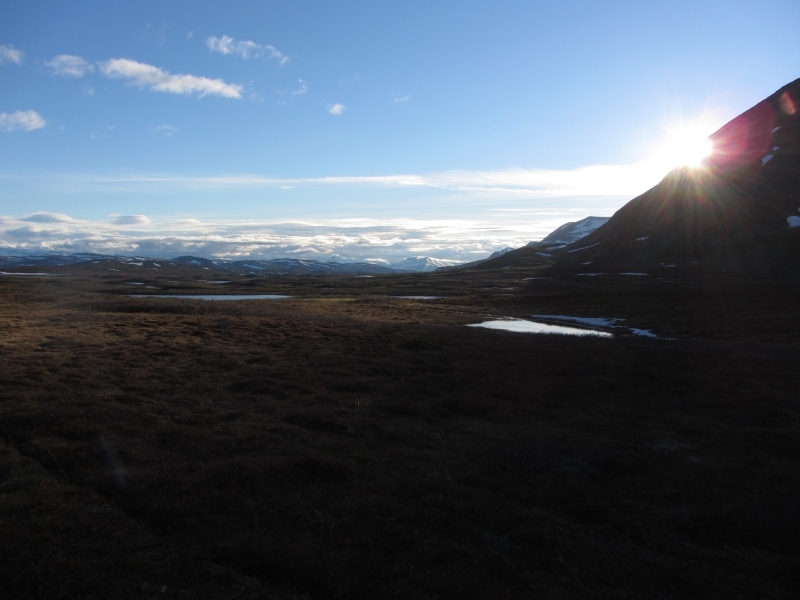 Slettnes is really a great place and perfect for this kind of field work, with its fantastic scenery and large number of birds around! We stay at the light house, right in the middle of the colony. 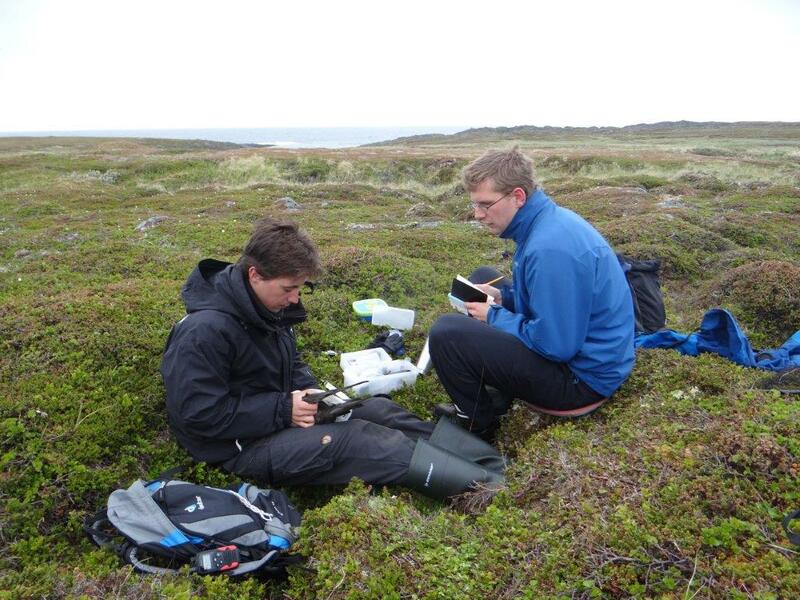 Today Hans and Janne left, next week Morrisson Pot, our Msc student, will arrive and we will move to the bird station, one km from the light house.